Since this week is all about items we're loving, I thought I'd share one of my dream purchases with you... the Ochre Arctic Pear chandelier. Ochre is a company started by two friends who met at a London art school. While still based in London, they now also have two stores in New York. But back to the Arctic Pear. This particular chandelier of their's haunts me...in a good way. Oh how I love it. I first fell in love this when I saw it in an Elle Decor feature on Kerri Russell's Brooklyn home a few years ago. I think part of the love affair was due to the fact that it was in "Felicity's" home, and Felicity was a girl after my own heart back in the day. BUT the main reason I loved it is because it is simply stunning-- a showstopper with no fuss. Here it is in Kerri's home. Yes, we're on a first-name basis. Since then, I've seen this light featured in so many beautiful spaces. It comes in several different sizes so you can get the perfect fit for each room. Double the pleasure at this Cobble Hill home designed by Blair Harris Interiors. 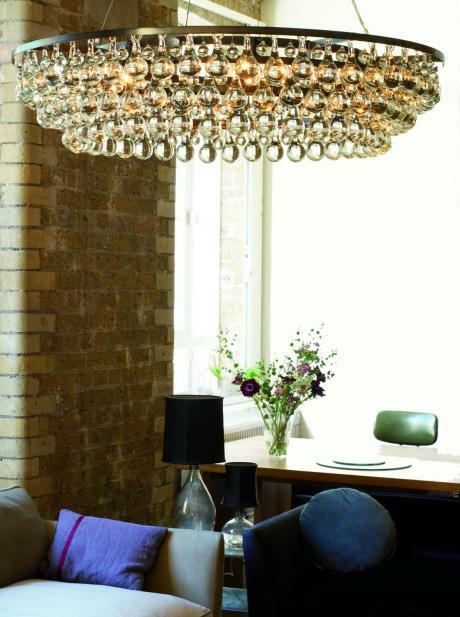 Another one that I think it worth a look is Jupiter Chandelier from ZGallerie. It is only available in one size (19.75" diameter), but it's also only $399. For a fraction of the cost of the other two, I'd say that's a win.